I'm not much of a pie person. At least the sweet kind. But if you stick one of these savory guys in front of me . . . watch out. Alone, I could devour half in like ten minutes flat. 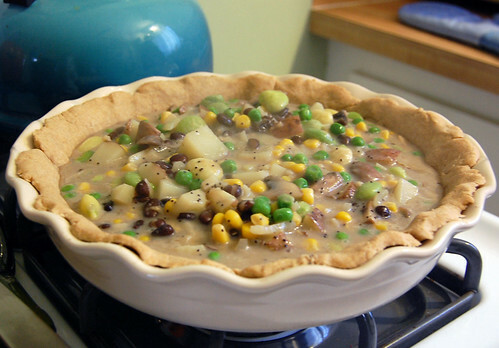 Some history: I made a veggie-pot-pie-esque meal last year using Bisquick (*shudder*), so when I mentioned our dinner selection to my husband, he begged me (really BEGGED me) not to make it. I forged on, however, and the next day, he eagerly packed two pieces of pie to take with him work. 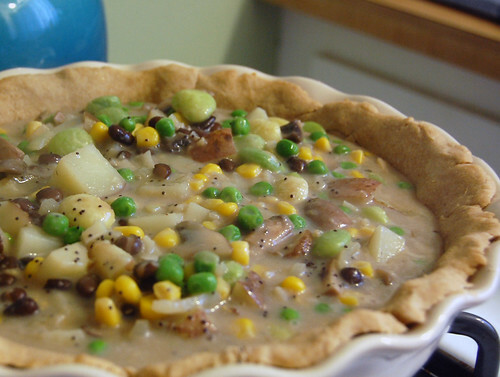 I don't need to tell you that veggie pot pie is a great winter dinner selection. But what I do need to tell you is that this particular combination of veggies is especially hearty and flavorful. Just look at those pieces of corn, peas, and lima beans . . .
Preheat oven to 375 degrees Fahrenheit (190 degrees C). Combine wheat pastry flour and salt. Put flour into stand mixer and add oil & stir until dough forms little balls. Mix the cold water into the dough. Form into a ball and divide in half. 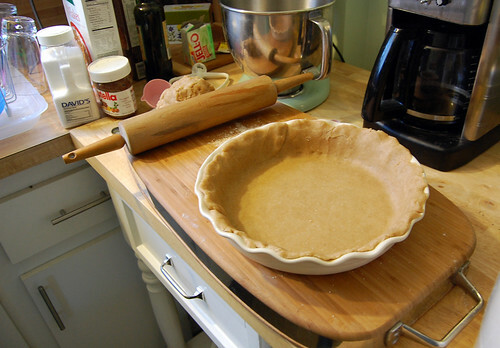 Roll out (with rolling pin) onto a lightly floured surface, and then place into a pie plate. Prick with a fork (this part is important) and bake for 12-15 minutes. Roll out the second half of dough for the top of the pie. Heat oil in a saucepan and saute the onions, mushrooms, and garlic. Add the flour and cook for about 2 minutes, stirring constantly. Slowly mix in the soy or rice milk and vegetable stock and cook until filling has thickened. Add potatoes and cook for approx. 1 minute. Add black beans, peas, lima beans, corn, salt and pepper and heat through. 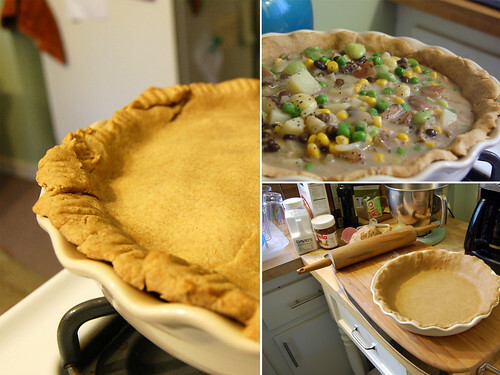 Pour mixture into the crust and top with the unbaked crust. Press edges together, but do not seal them completely. Bake for about 25 minutes (or until the crust is golden brown).